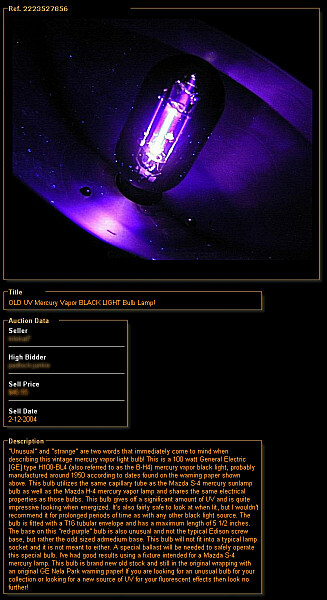 This writer has been archiving online auctions relating to early electric lighting since 1999. 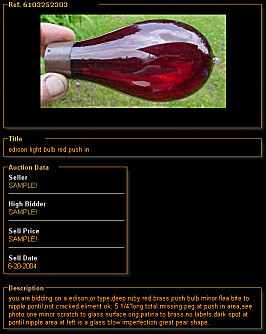 Data including auction description, sale date, seller's username, high bidder's username, sell price, auction description and photographs are included in a database accessible through these pages. The intention of this archive is purely for reference and is not intended to be used as a price guide. This area is currently reserved for a small group of members who have been granted access to the archive. If you desire access, please contact the writer to discuss full access to this area. To get a sense of the material contained in the auction archive, a preview area is provided. The preview contains thumbnail images of all archived auctions in the database, minus the information outline above. Sample images are shown below that illustrate how this data is presented to members. A preview of the archive can be accessed by issuing the username: preview and the password: preview in the login box below. Upon entering the username and password, a new page will appear showing a list of categories. Please click on the Auction Archive category link to preview the archive. ***Please note that this database is not fully populated. ***Check back again soon as more auctions are to be added when time permits!